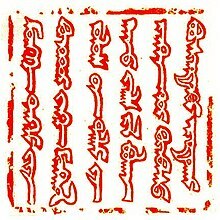 The Imperial Seal of Mongolia using the classical Mongolian script, as found in a letter Güyük Khan sent to the Roman Pope Innocent IV. Mongolian calligraphy is a form of calligraphy or artistic writing of the Mongolian language. Although the Mongolian language in Mongolia uses a Cyrillic orthography adopted during the Communist era, Mongolian calligraphy is written in the traditional Mongolian bichig script. In 2013, Mongolian calligraphy was inscribed on the UNESCO List of Intangible Cultural Heritage in Need of Urgent Safeguarding. At present, only three middle-aged scholars voluntarily train the small community of just over twenty young calligraphers. Traditionally, mentors select the best students and train them to be calligraphers over a period of five to eight years. Students and teachers bond for life and continue to stimulate each other’s artistic endeavours. The rate of social transformation, urbanization and globalization have led to a significant drop in the number of young calligraphers. ^ "蒙古文书法 - 政协书画院 - 中国人民政治协商会议内蒙古自治区委员会". Nmgzx.gov.cn. 2011-03-23. Archived from the original on 2014-07-15. Retrieved 2013-10-06. ^ "Mongolian Calligraphy". unesco.org. Retrieved 2016-01-07.